What is the Merit Based Incentive Payment System? The Merit-based Incentive Payment System is CMS’s new attempt to control Medicare Spending. This program consolidates three existing programs and one new program, in order to derive a MIPS score, from 0 to 100, which can significantly impact a provider’s Medicare reimbursements for each payment year. For the first two years of MIPS CMS has deemed physicians, physician assistants, nurse practitioners, clinical nurse specialists, and nurse anesthetists Medicare Part B providers as eligible professionals. As you can see the list of eligible professionals starts out with the highest level providers but quickly expands to cover a large majority of providers. More EPs will be added in 2019. These EPs include physical or occupational therapists, speech-language pathologists, audiologists, nurse midwives, clinical social workers, clinical psychologists, and dietitians or nutrition professionals will be deemed as eligible professionals for the Merit Based Incentive Payment System. Providers not meeting "low volume threshold"
Furthermore, a provider group including such eligible professionals for each respective year will also be deemed eligible as a group entity for MIPS by means to be defined in the MIPS final rule. 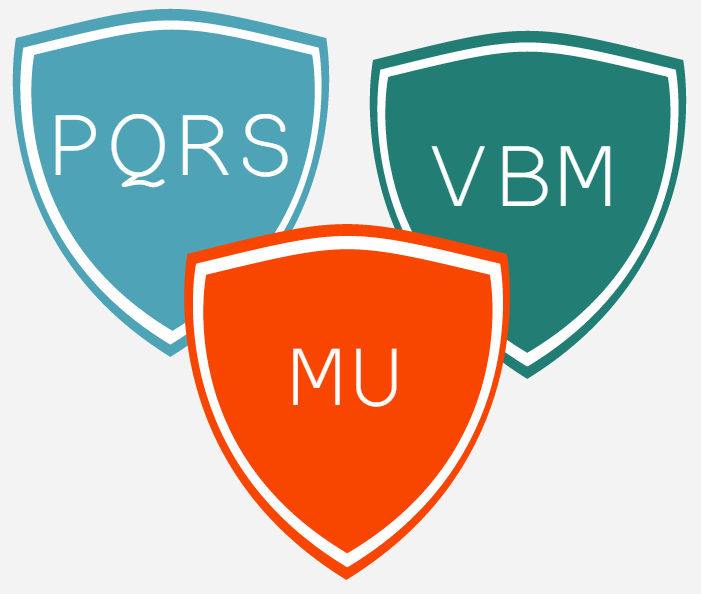 Some components of MIPS, such as PQRS, already support the concept of group measurement. However, other components, such as MU, only measure individual providers. Therefore, the MIPS final rule will need to define how individual MU performance is rolled up to determine group MIPS performance. So how does MIPS plan to succeed in controlling spending by Medicare on physician services, where other pieces of legislation have failed? 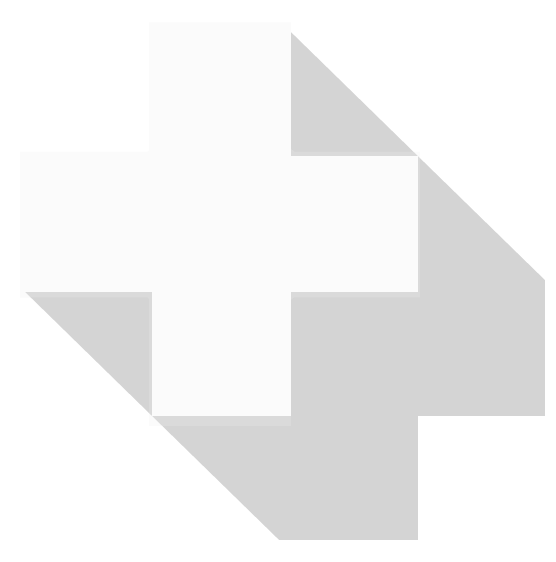 It plans to utilize three existing programs (Meaningful Use, the Physician Quality Reporting System, and the Value-Based Modifier (VM) Program) and one new program (called Clinical Practice Improvement). In short, MIPS consolidates and strengthens the financial impacts of these programs, while continuing their performance measurement and reporting mechanisms that have become familiar to providers over the last few years. On What Metrics Are Performance Scores Based? A providers 2017 MIPS performance in two of these categories, Meaningful Use of a Certified EHR Technology (MU) and PQRS (quality and cost), will represent 85% of their total possible score. What Does "Clinical Practice Improvement" Mean? What are Alternative Payment Models (APMs)? 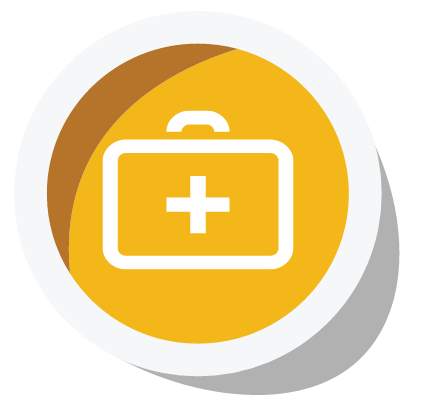 There are varied payment methodologies being developed by payers for health care services. 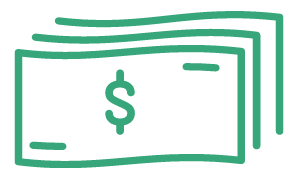 Payers are moving away from fee-for-service (FFS) volume-driven health care services to value-based payment models that incentivize providers on quality, outcomes, and cost containment. In the near future it is likely that your practice will feel the impact as payment models move away from FFS to other payment formulas. The intent is to promote patient value and efficiency, but one consequence is to shift some risk to you, the physician provider. Practice viability will be dependent on how well quality, cost, and efficiency are managed. Accountable Care Organizations (ACOs), patient Centered Medical Homes, and bundled payment models are some examples of APMs. 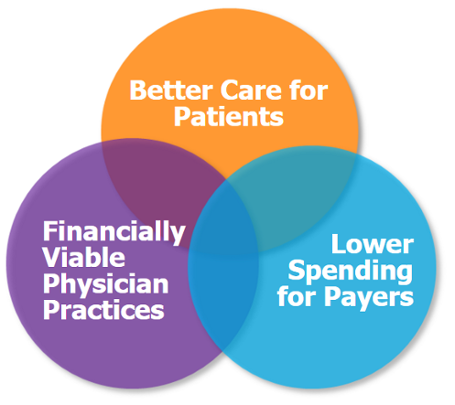 How does MIPS impact physician reimbursement? The first payment year is set to be 2019, and because MIPS follows the same 2-year lag of similar programs, 2017 is set to be the first performance year of MIPS. For the 2017 performance year (and the respective 2018 payment year), three programs (MU, VBM, and PQRS) will continue as separate and distinct measurement and payment adjustments until the 2017 performance year, at which time they will be consolidated with the fourth and new program (clinical practice improvement) to generate a provider’s MIPS score. 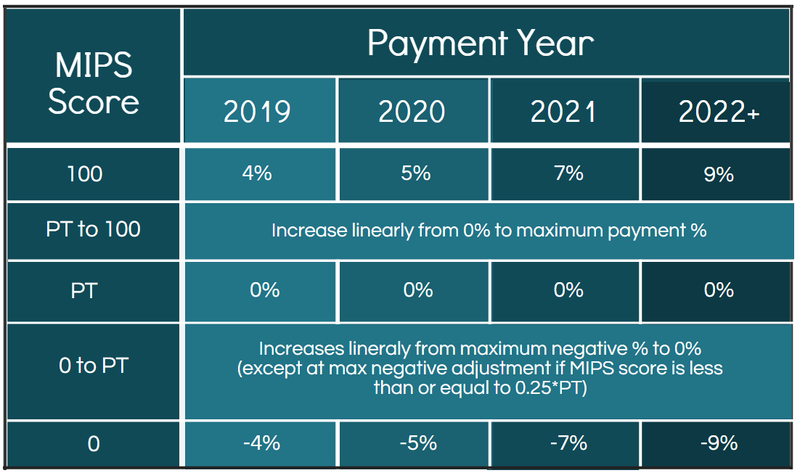 The MIPS score will have a maximum impact of +/-4% on reimbursement for the 2019 payment year and this maximum impact will increase to +/-9% for the 2022 and subsequent payment years. The maximum positive adjustments shown may not be the highest adjustment providers could see. The maximum payment adjustment is multiplied by a scaling factor so that the total of all positive and negative adjustments across all MIPS eligible providers, results in either neutral or reducing impacts on Medicare budgetary spending. Thus, controlling or reducing Medicare spending on physician services. The performance threshold (PT) is the demarcation MIPS score between positive or negative adjustments and is determined every year as the mean or median of the MIPS scores for all EPs in a prior period as selected by CMS. The PT will likely be specified in an annual CMS final rule which will be published prior to each performance year. The scores in between the maximum positive and negative adjustments are calculated on a linear basis. For example, if the PT is set at 40 and provider A scores a 35 while provider B scores a 20, provider A’s negative reimbursement would be just below 0% (around -0.5%), while provider B’s negative reimbursement would be lower than that (around -2.0%). The only exception is at the max negative adjustment if the MIPS score is less than or equal to 0.25 * PT. For example, if the PT was set at 40, then a score of (40*0.25) 10 or below would garner the max negative adjustment. What is the exceptional performance bonus? CMS will define an “exceptional performance” bonus in the form of an additional payment adjustment of up to 10% for eligible providers who are above the 25th percentile of positive MIPS scores. This is a significant incentive advantage for each performance year, and as such, should increase providers’ motivation to preform highly on MIPS year after year. CMS is authorized to “take into account” year-over-year improvement of MIPS eligible providers in order to calculate the scores for the PQRS and VBM categories. 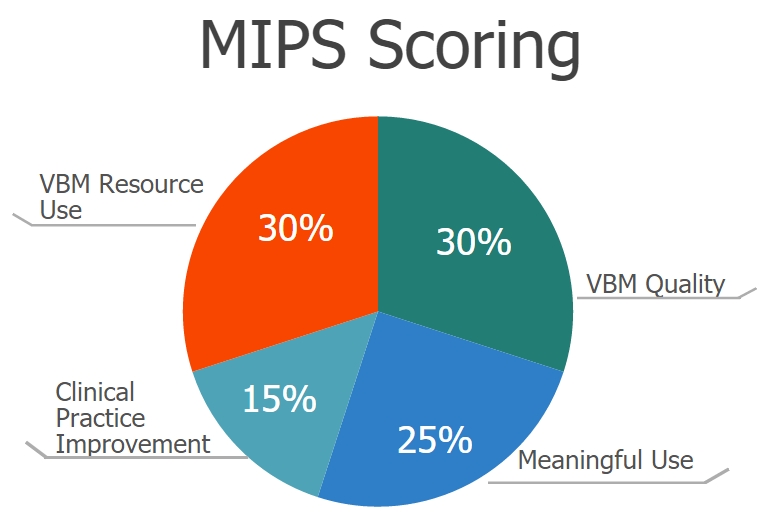 Meaning low-performing MIPS eligible professionals may still receive credit from improving their scores even if the new scores are still in the lower tiers. This policy should encourage low performing providers to continue to improve. The key takeaways are that no one knows where the PTs will fall, so the performance of MIPS eligible providers is extremely important if they want the best shot at receiving positive payment adjustments. Also, because there is no neutral zone, MIPS eligible providers will almost always receive positive payments or negative penalty adjustments. © 2019 CENTRIC HEALTHCARE SERVICES. ALL RIGHTS RESERVED.